Josée Bienvenu is pleased to present My Potential Futures, a project by Beth Campbell. Drawing upon philosophy, phenomenology and psychology, Beth Campbell’s drawings and sculptures map a multiplicity of alternate realities. She started to develop the diagrammatic series My Potential Future Based on Present Circumstances in 1998. Giving physical shape to streams of consciousness, each drawing branches out from a single occurrence in her everyday life into a host of outcomes ranging from fantastic to abysmal. The highly subjective, personal voice behind Campbell’s text departs from the taut vocabulary of conceptual art while appropriating its tropes. The exhibition consists of three larger scale drawings spanning from 2008 to the present as well as two new mobiles. 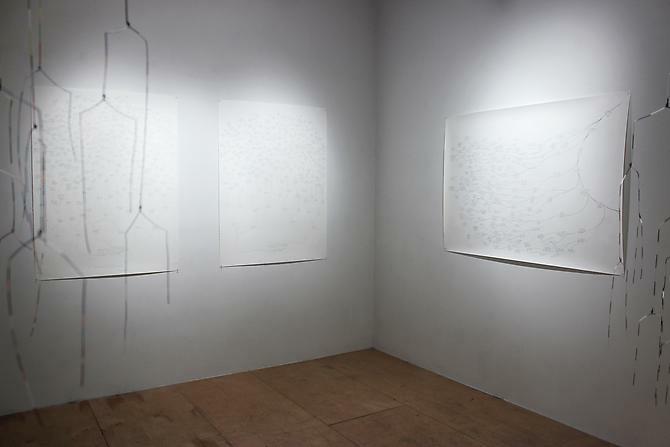 The mobiles are a three dimensional extension of the Potential Future drawings. Constructed of thin wire and bent steel, their focus is more on structure and line than on language. They function as drawings in space. Their abstract forms evoke neurological diagrams, trees, and circulatory systems, while also serving as speculative visualizations of possibility. The interplay of lines creates an optical interference effect similar to moiré patterns, causing the surrounding space to vibrate and seemingly shift. This contrast catalyzes the tension between physical and virtual, ordinary and surreal.Born in Illinois in 1971, Beth Campbell lives and works in New York. Campbell’s commissioned projects include Following Room at the Whitney Museum of Art (2007) and Following Room (Trento) at Manifesta 7, Trento, Italy (2008); Potential Store Fronts for the Public Art Fund, New York (2007). Recent solo exhibitions include Seomi Gallery, South Korea (2012); The Sculpture Center, Cleveland OH (2010); Country Club Projects at the Buck House, Los Angeles and Nicole Klagsbrun Gallery, New York (2009); and the Tang Museum, Saratoga Springs, New York (2006); The Drawing Room, London (2005). Other museum exhibitions include the Brooklyn Museum of Art (2004); Carnegie Museum of Art (2002); Greater New York, PS1 Contemporary Art Center (2000); White Columns (1999); She is the recipient of a Guggenheim Memorial Foundation Fellowship (2011), a Louis Comfort Tiffany Memorial Fellowship (2009); and a Pollock-Krasner Foundation Grant (2006). She has been an artist-in-residence at John Michael Kohler Arts Center (2009); the Lower East Side Printshop (2006); and Dieu Donné (2003), among others. Her work is included in collections of the Whitney Museum of American Art and the Museum of Modern Art, New York.